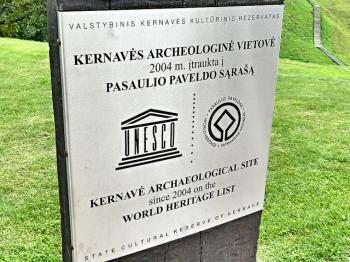 Kernavë Archeological Site (Cultural Reserve of Kernavė) comprises the remains of human settlements, burial sites and five hill-fortresses from the late Palaeolithic Period to the Middle Ages. The findings show evidence of the pre-Christian heritage of the region, and the subsequent conversion to Christianity. Around 1300, a duke settled on one of the natural hills along the Neris river and used the other hills for his defense system. The medieval feudal town was finally destroyed by the Teutonic Order in the late 14th century. In later years, the remains were covered with a layer of sand and sediments which preserved most of the relics intact. The WH meeting in and around Vilnius provided me with a good opportunity to polish up some reviews of WHS in this corner of the world. Kernavė Archaeological Site had been reviewed for the last time 6 years ago, and – like the Curonian Spit – its distinguishing features always had been a bit of a mystery to me. 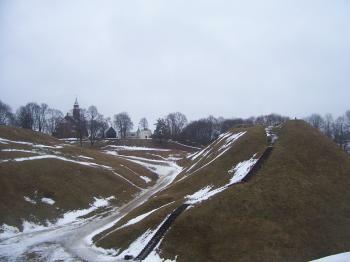 It is also the least visited site in Lithuania among our subscribed travellers. However, it lies only 45 km from the capital and is open 5 days a week without any restrictions. It is a largely unexcavated archaeological site, harbouring the remains of a settlement and five hill-forts dating from the 12th – 14th century. Kernave slowly had grown into a permanent town at this strategic location near the Neris River from the 1st century on. Its OUV lies mainly in the construction of these hill-forts, as well as the mixture of pre-Christian and Christian traditions (shown for example in the burial rites). The Lithuanians were very late to embrace Christianity: the official year is 1387, ending the existence of the last pagan nation in Europe. Since 2012, the interpretation of this WHS has greatly improved due to the commissioning of a new on-site museum. The exhibition lies mostly underground, and lighting is kept to a bare minimum. This benefits the many audiovisual features. During summer, events of Experimental Archaeology are often held at the site and they’ve used recordings of these to explain the use of findings that are displayed in adjacent showcases. As many of the objects are quite primitive and repetitive (think endless numbers of earrings), the videos make the exhibition much more interesting. The only memorable object found & shown here is a small sculpture of a male figure, that is said to represent a pagan god (but could also well be a totally unrelated trade product obtained from Germany). After the museum, which lies at the entrance to the archaeological site and next to the modern church, we took in the views of the five hills near the river that comprise the main site. It’s difficult to see them all in once; and it's even more difficult to see fortresses in them: they look like tumuli (such as those in Gyeongju in South Korea) or a natural curiosity such as the Chocolate Hills in Bohol (Philippines). Fortunately we had just seen an animated video in the museum, showing the development of the hill-fortresses through the ages. The nobility and their guards lived on top of these hills, while the common people still stayed down near the river. The lifestyle of these people is the subject of the Open Air Museum, also a fairly recent addition to the complex. It consists of a small village of wooden huts. There's not much 'story' told here, I have no idea which period they are trying to re-create or houses of which members of society. Also, no connection is made with the wooden chapel that seems to be the only original building still remaining on the grounds. One of our Swiss participants declared their interior "just like a contemporary Alpine mountain hut". Long flights of stairs have been added to the hills, to allow climbing without disturbing the whole mound. Our guide for the day did not take us up there (which I really did not mind much as it was a hot day & I do not need to climb everything), but some of our WH group members wanted to. They succeeded taking in a couple while the others walked back slowly to the minibus. In all, we stayed at the site just under 2 hours - which proofs that with the additional 'attractions' there's more to see than in 2010 for example. There were some other visitors around, though it still it is not nearly as popular as Trakai Castle or Vilnius. Visited this site in August 2017. A visual representation of site is a little bit strange: five hills and green valley from the hills to the river. When walking around the hills it is quite difficult to imagine how the constructions were located; however in the museum there is visual demonstration of the place during prosperity times. But still it looks like that the hills’ surface is too small to accommodate anything larger than one house circled by a wall (and I can image how it was painful to carry water, food and everything all the time up the hill). Unfortunately, there are no visible remains of the human settlement on the site, but the overall setting and views are very beautiful. Not surprisingly, the area was inhabited for over 11,000 years and this one of the important site values. It is advisable to visit small museum as well to see some additional information and displays (as coin collector I like the coin with the knight most). Everything that can be said about Kernave has already been mentioned on this site - it is a reasonably interesting site that makes for a nice excursion from Vilnius and has a modern, well-presented museum next to it. You can easily imagine the forts on top of the huge mounds and the location of the village by the river below. I'm glad I went there as part of our guided trip, as it seems a bit difficult to reach by public transport. I visited this WHS in August 2016. It's an interesting side trip from Vilnius and can easily be combined with the Struve Geodetic Point of Meskonys. In both cases don't expect to see much. Further reading and using your imagination will be required and even by doing so, most probably these WHS will not rank high on anybody's list. Alas, visiting by car (with a GPS) is quite straightforward and the Kernave Archaeological Site is open and free to visit all year round. The small nearby Kernave Archeological Museum is always closed on Mondays and in July and August is also closed on Tuesdays. Entrance to the museum costs 2 euros and worth visiting to see some of the remains found here as well as some informative videos on the different settlements from Stone Age, Bronze Age, Iron Age, Roman period to the Middle Ages. 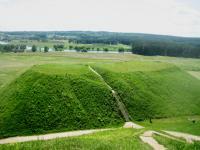 Lithuania is a country full of hill forts (around 1000) and the 5 hill forts of Kernave are the highlight of the archaeological site. 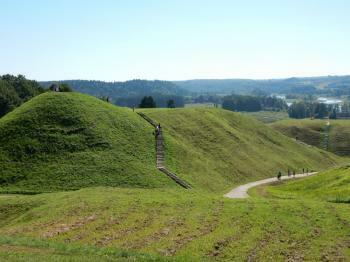 All you'll see (and climb if you want) are 5 mounds with wooden stairs leading to the top. Don't expect to see any wooden forts as they have rotten away quite a long time ago. They are believed to be natural hills which have been adjusted for defensive purposes and they were the main type of ancient settlement since the end of the Bronze Age up to the 14th century. The oldest is the central one known as Altar/Aukuras Hill Fort on top of which was a duke's castle. In the 13th and 14th centuries the 5 hill forts were united into a complex. After climbing the hills and taking in the green landscape and panoramic view of the Neris river, I walked around the foundations of Kernave's old churches (15th century) and the wooden chapelwith hewn logs (18th century) and the stone chapel-mausoleum (19th century). There is a UNESCO information board just before passing the dismantled turnstyles and a UNESCO inscription sign near the hill fort panoramic viewpoint (photo). If possible, try to plan your visit Wed-Sun to be able to at least visit the archeological museum. I spent a pretty bleak morning at Kernave in February 2010. The site itself was fairly interesting and larger than I thought it would be. The main point of interest are the 5 Hills that once housed forts but now just feature a set of steps to give a view over the surrounding area. The plain between the hills and the river is also included in the inscription; it was here that the lower towns were originally constructed. There are archaeological findings here dating back 10 millennia, including sacrificial sites in the small forest. I trekked across this area to get a good view of the Hill forts. There are no actual remains to be seen at this site so don't expect any grand ruins, but It was interesting to see how the area was consistently inhabited. The highlight for me was climbing up the Hill forts. There are no hand rails which would normally be fine but there was a fair bit of snow and ice on them when I visited so made for a somewhat precarious climb, this did make the view from the top even more rewarding though. My visit coincided with a relative thaw in temperatures (it was about 2°C but felt much colder on top of the windy hills) and as such there were streams of meltwater running along almost every path, making for some very soggy and perilous walks. A real word of warning though for visitors, especially in winter. The Bus connections from Vilnius are not really geared for sightseeing. (Bus times can be found here). I ended up here for 3 hours and nothing was open. In fairness I knew all this in advance, a friend who visited in Summer said that there was very little to keep you entertained beyond an hour or so and the Tourist information centre in Vilnius told me not to bother making the trip, however she was very unhelpful and more interested in her own phone calls than in helping tourists so I glossed over her perhaps accurate recommendation. It was an interesting if cold and slightly too lengthy a visit. I imagine a quick trip in Summer would be a very enjoyable and interesting experience. 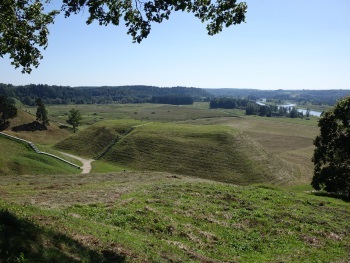 Some 60 km north-west of Vilnius, the archaeological site of Kernave is likely not to be on top of your list of places to visit in Lithuania. And it could probably remain there, unless you are heavily into archaeology - then Kernave is an absolute must. Kernave had existed since the age of Lithuanian dawn but was completely destroyed by the Teutonic order in the 14th century. So what we can see today is only a number of large mounds - still unexcavated - where underneath lies the remains of hill forts, settlements and numerous burial sites. My own visit was a fairly short one though I got a thorough explanation of its importance from my guide. But my personal memory of Kernave will always be when climbing the top of one of the mounds, looking out over a stunningly beautiful landscape bathing in sunlight. From its forested hills down to the river in the valley made you realise that whoever choose this location thousands of years ago realised both the strategic as well as the esthetical value of Kernave. With your own car, the site can be reached in half an hour from Vilnius. Buses (marshrutkas) also stop there, but only 5-6 times a day. Built in the 1st century: OUV: for its pre-Christian history and Hill-Forts: "From the 1st to 4th centuries CE, large settlements were scattered over several kilometres on the banks of Neris and in the Pajauta valley. Some hills were adapted to defence (Aukuro Kalnas, Mindaugo Sostas and Lizdeikos Kalnas Hill-Forts)."